Even in a weak real estate market, the ramshackle boarding house at 301 Nantasket Ave. in Hull attracted a packed house of bidders who could envision a promising future for the ocean-view site. The winner at the Town Hall auction last week was contractor Jack Mitchell, who outbid eight others to snare the building for $205,100. "I know I can renovate it; I've taken on worse. 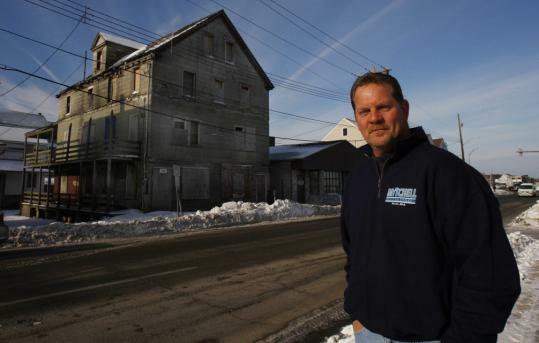 I like the before and after," said Mitchell, who owns Mitchell Construction farther down Nantasket Avenue. "I'm not doing this short-term," he added. "In the long term, there's a lot that will happen in that area." The area is across from the Clarion Nantasket Beach Hotel and condominiums on a commercial street with empty storefronts, as well as small restaurants and shops. The Hull Redevelopment Authority owns a large vacant lot at the end of the street and recently won a court challenge to its plan to sell the property to a developer who plans to build. "It's a business area that is ripe for redevelopment," said Town Manager Philip Lemnios, who served as auctioneer. "That's a block that, with not a lot of effort, could really blossom. "The fact that there were a lot of interested parties [at the auction], even though the building requires significant investment, indicates people are saying there's value there. It's a good sign for Hull," he said. Others say the interest could be a sign that the economy is starting to perk up, at least locally. Among those bidding on the property were those with plans to make it a Japanese noodle shop, a barbecue restaurant, a demonstration "carbon-free" residence, and other retail-residential combinations. Mitchell "is very well known, a very good builder," said Andi Cohen, a realtor with Sea Coast Homes in Hull. "If he thinks it's coming back, I think it's coming back. Because he's been right on the money" in the past. "The economy's been bad, but people are still rebuilding and investing down here," said Bartley Kelly, chairman of the Hull Redevelopment Authority and an inspector for the town building department. "They're not making any more waterfront property, and people still want to live near the water." The town seized the 5,890-square-foot parcel, which includes a dilapidated single-family home, for back taxes in 1998 and has been trying to get rid of it for years. A Norwood developer agreed to buy it for $235,000 for condominiums, but backed out, forfeiting his $11,000 deposit. After neighbors complained that the buildings were an eyesore and a hazard, selectmen tried again to find a buyer last fall. When that effort failed, they scheduled the auction. The town will get about $170,000 from the sale, to pay for back taxes, interest, and the auction costs, Lemnios said. The remainder will go into a trust set up for the former owner, who is not mentally competent, he said. Mitchell, 50, grew up in Hull and his local roots go back seven generations. He said he's not rushing to develop the site, but will board it up for now and secure it against the weather. He plans to demolish the small house and renovate the 22-room boarding house into three or four apartments, with commercial space on the ground floor. The town has rezoned the area to allow residential and commercial use of the site, although parking remains an issue. "I take pride in taking rundown buildings in town and turning them into something nice," Mitchell said. "This will be a major challenge."